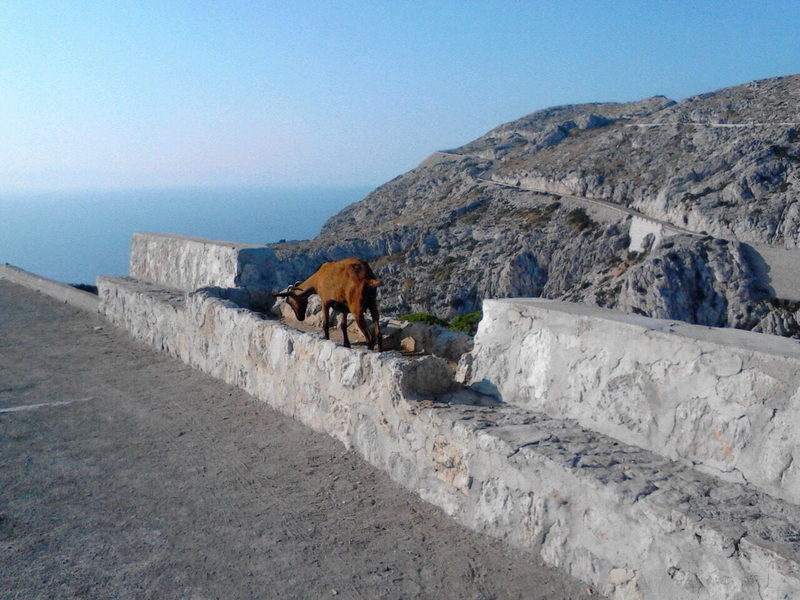 Wild goat prepares for nap on Cap de Formentor, road in background. Cap de Formentor rises 384 meters from the sea on the northern tip of Mallorca, Spain. I’m on the island with my partner, Lisa, to begin my month (or more) of 50th birthday celebrations. We ride our bikes together in the early morning peace of Port de Alcúdia and Port de Pollença. With the bay on our right, we pass old stone buildings sliding gradually into the Mediterranean Sea. 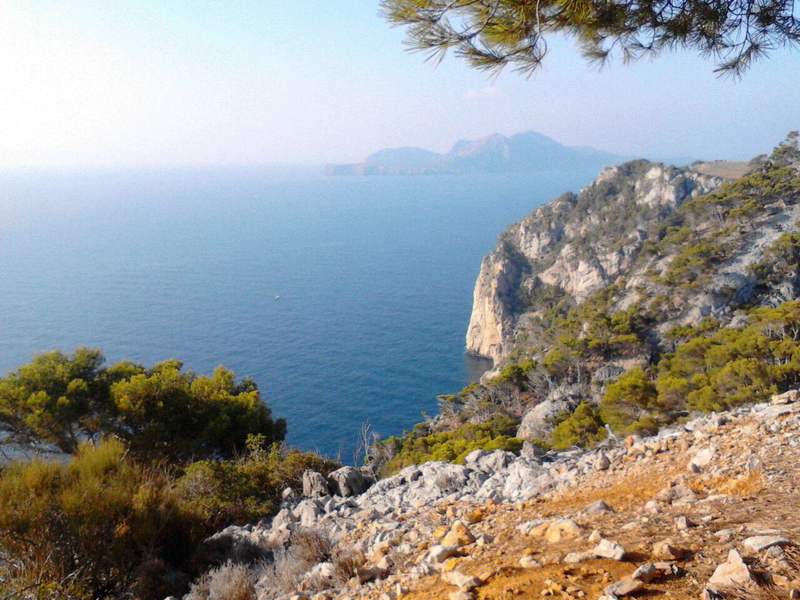 I head for the Cap de Formentor, about 20 kilometers round trip. I will climb and descend through the rugged cliffs above secret beaches. Destination: lighthouse at the end of the cape (Cap). Lisa turns around when the road gets steep, just outside Port de Pollença. She will explore the island’s Ecovies — quiet rural roads. I’m thankful for my rental road bike’s compact gearing, making climbing fairly easy. I’m on the west side of the cliffs, in the shade of the early morning. A goat walks on top of some rocks above me—must be a farm around here somewhere. I reach the first overlook—not too much effort, I think. Then some major descending begins through hairpin turns, shaded by pines. I glimpse the piercing blue of the sea below sheer white faces of 200-meter cliffs behind me as I twist and turn toward the low point of the ride. I focus on the unfamiliar road, watching for cars, and wary of the camber of curves. I reach the natural park in the middle of the island, and the road turns to crap. My bike bounces over chunky asphalt, getting steeper and I have to get out of my saddle. Tunnel—no one told me about this! Not that I asked. Two cyclists with headlights scream past me on their way down. I have no light. I can see the light at the other end, but can’t tell how long it is. Fortunately, I have seen only one car so far. I pedal furiously into the tunnel, hoping my speed uphill will bring me to safety. I hit total darkness, except for light from tunnel exit that seems farther away. My eyes don’t adjust. My stomach sinks in fright. Finally, the tunnel gets lighter and I emerge into daylight. Then I see her. A small brown goat happily munches grass next to the speed limit sign. I realize these goats are wild, a strange concept in Spain with its thousands of years of goat herding. Up and down I climb, and at last I see the lighthouse. Another descent, another climb and I’ve made it! I park my bike and see two other cyclists watching a goat walk along the parking lot wall. The goat aims for me. I back up and watch her amble past my bike; I confirm that my energy bar is in my jersey pocket and not my seat bag! A few meters from my bike, the goat lies down for a nap in the sun. Just like that, I’m laughing with the other cyclists. I take a few pictures of the goat, then the spectacular 360-degree view hits me. There’s the serpentine road I’ve just biked, the original rocky path converted to a hiking trail, the cliffs of Formentor, and the many blue hues of the sea. The goat made me see. On the way back down and up and down, I stop every time I see a goat. A family gathers by the guardrail. I see more of the cape. 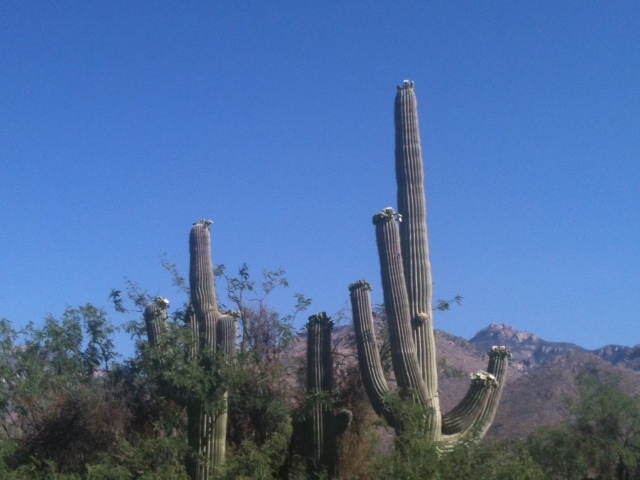 I see rocks in the road and look up to see a goat climbing a steep slope. Goatslide. I stop frequently on the return to Port de Alcúdia. I soak in the other capes and bays and beaches of Mallorca. Lisa, a Capricorn, sees my goat pictures and tells me they are Balearean Goats that roam wild only on the Balearic Island of Mallorca. Goats enjoy the rocky slopes of Cap de Formentor every day: climbing, descending, snacking, resting. An excellent way to ride a bike today too. View from road on top of Cap de Formentor.